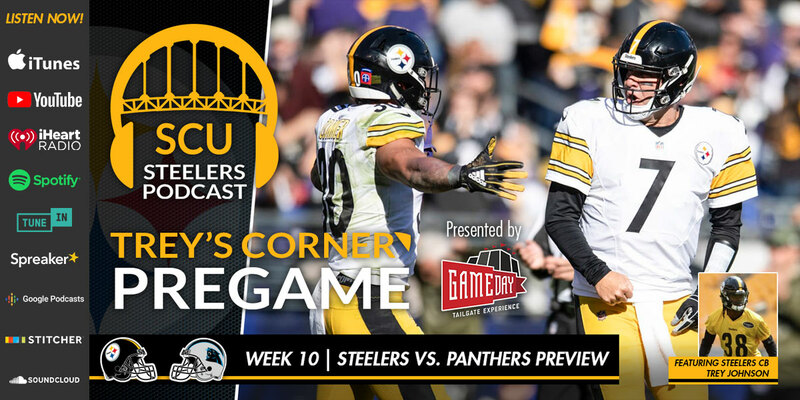 Pittsburgh Steelers cornerback Trey Johnson returns for another edition of Trey’s Corner, as Trey joins Joe Kuzma to preview Thursday’s primetime matchup between the Steelers and the Carolina Panthers. Pittsburgh is set to host Thursday Night Football with their color rush uniforms pressed and ready to go, but how well has the Black and Gold done on short weeks? The stats may surprise you! Trey and Joe also breakdown how the Steelers and Panthers are eerily similar in so many ways and why this game could come down to a pair of Pro Bowlers from last season. Party with Gameday Tailgate Experience at the Steelers vs. Jaguars game on November 18th for the best open bar, all you can eat tailgate with DJs, games, celebrity hosts and former Steelers players. Visit https://www.steelcityunderground.com/jaguarstailgate/ for tickets, more info, and special discount code for our listeners.